Now this is a gorgeous classroom: Refugio, in Paso Robles, CA. Now that the weekend is nearly here, it’s time to pack your bags and explore the West! No plans yet? Find some inspiration with our 5 favorite travel finds of the week. Cook the BooksProlific cookbook author Brigit Binns—who wrote Sunset’s Eating Up the West Coast, just published in April—has collaborated with celebrity chefs on both coasts, including New York’s Michael Psilakis and L.A.’s Joachim Splichal. 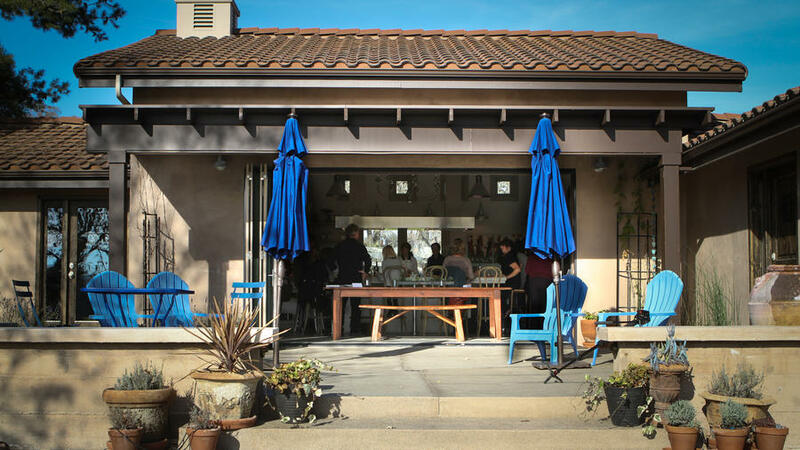 She taps into those culinary-industry connections for the intimate cooking classes she launched last year at Refugio, her 5-acre property in the Paso Robles countryside. This month, heavy-hitters Evan Kleiman and Clark Staub will take over the spacious, sunny kitchen to teach their favorite subjects: For Kleiman, that’s making fresh fruit pie; for Staub, creating a meal from seasonal, local produce. Binns will instruct classes as well, including her popular Perfect Steak and Perfect Caesar class. SeeJust add water: This Seattle street-art project is only visible when it rains. So cool. TrekCan you believe The Goonies came out 30 years ago this summer? Check out the so-called Goonie Trails of Astoria, Oregon, where the film was based—and get your Truffle Shuffle on. Go With the FlowGlass art is having a red hot moment, and this month California’s Bay Area is at the molten center of it all. Glass Art Society‘s 2015 conference, in San Jose, spills over into events and exhibitions open to everyone. Glassblowers perform demos at a mobile furnace while artists offer sculptures, vessels, and jewelry at auction. You can take a class—on anything from blowing to casting—taught by art-world stars appearing at the conference. Galleries are firing up exhibitions, making this an ideal time to explore San Jose’s expanding art scene: At Anno Domini, about 50 glass artists, many of them local, exhibit work (through Jun 13); at the Movimiento de Arte y Cultura Latino Americana gallery, the glass art (some of it fashioned from empty tequila bottles) fuses politics and beauty (Jun 5–Aug 8). SavorA community-wide dinner party, live music, and local beer and wine in one of my favorite cities in the West? Sold. Park City, Utah hosts its annual Savor the Summit party this Saturday night right on Main Street. Want more travel inspiration? You can find past travel roundups here, here, here, here, here, and here!